I wonder when (if at all) it is appropriate to use icons next to menu entries (drop down menus, right click contextual menus etc). I have noticed that pretty much all of the menus I have seen only uses text, wouldn't these lists be easier to scan if icons were present to differentiate the menu items from each other? Further - in the seldom cases I've seen where icons are used in menus, I've noticed that those are in grayscale. Wouldn't colors make those icons even easier to differentiate from each other? I mean - icons are used everywhere else, why are menus pretty much excluded? I believe that by adding icons to all of the menu items would make it hard to scan and hard to navigate. The user will be distracted with the array of icons and colours and then they have to scan the menu either for a familiar icon and then read the text next to it to make sure that they have chosen the right menu item, or they have to overlook the icons and go for text. 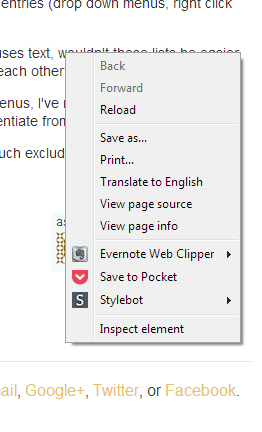 Also on my Chrome I have extensions like Pocket, Evernote and Stylebot installed and the icons are very helpful! 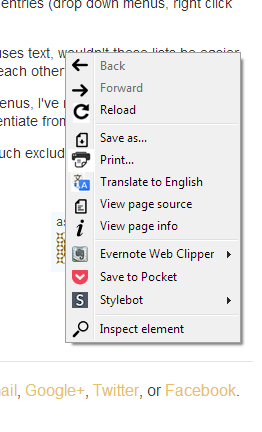 Now take a look at what would happen if chrome by default would have their menu full of icons! As you can see 2nd menu didn't make it any better actually I think it looks overly complicated, also if you look at items like "Translate to English", page source are almost impossible to understand without reading the text. Also try reading the menu, you will notice that icons are shouting and demand your attention. Not the answer you're looking for? Browse other questions tagged icons menu contextual-menu or ask your own question. Are radial contextual menus better than vertical list menus? Do icons need to be consistent across different themes? Thoughts on mobile 'matrix' style navigation? Are button wheels around cursors ineffective?